The loudest Bluetooth speaker in 2018 is a fun topic to discuss. Why wouldn’t you want a Bluetooth speaker which disrupts the neighborhood? Imagine walking around and everyone hearing your favorite songs. By the time they set eyes on you, they’ll know you’re a fan of hip-hop and love dancing to trap music. But in all seriousness, having a loudspeaker is just fun to have. Enough of the fun talk, let’s get down to business. If you want to fill out a room with sound, this will complement your desire. You might hear a lot about hi-fi, but if you haven’t, hi-fi is an acronym for high fidelity. High fidelity means high-quality reproduction of sound. Compare this to low-end audio equipment and you’ll start saying hi-fi also. What makes Cambridge Air 200 hi-fi is a built-in subwoofer and a powerful amplifier. 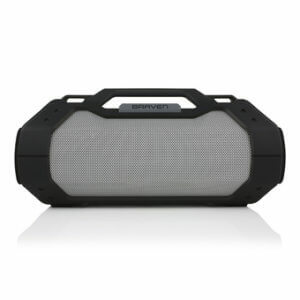 It stands out among other Bluetooth speakers because of the amount of power it generates for its size. 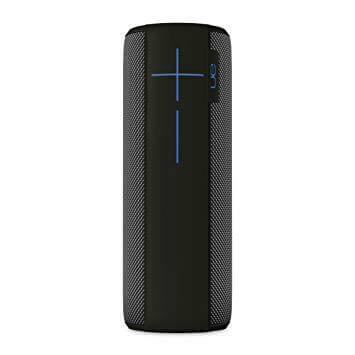 Coming in at a whole 11 pounds, with dimensions of 17.7 x 8.7 x 6.9 inches, the Cambridge Air 200 is standard for portable Bluetooth speakers. You usually experience 20-40 watts for a regular Bluetooth speaker but we guarantee this one brings more wattage. For a speaker of this size to generate such power, there needs to be a driving force. That driving force is a new technology called Balanced Mode Radiator. This technology separates itself from the mediocre ones by packaging treble, mid-range, and bass. With this technology, it nets you a wide range of frequencies. Its ability to be placed anywhere comes from their 180-degree sound dispersion. It can go from horizontal to vertical planes without losing a step. One constant complaint with this loudspeaker is the sound distortion when switching tracks. The network technology seems to be the main problem, so beware when purchasing this product. Doing deeper research will help you avoid any lowlights a particular review will miss. If you research the Megaboom on Amazon, you’ll see it’s waterproof and shockproof. 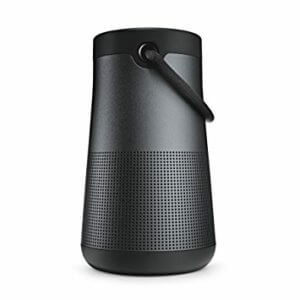 Its cylinder design gives it a 360-degree sound with deep bass. Another benefit to the Megaboom is its 20-hour battery life. Think of all the places you can bring it. Beaches, mountains, and walks outside. You’ll always be surrounded by music if you decide to purchase the Megaboom. If you’re with someone else along with the speaker, you can use the other person’s device to connect to it. It’s able to connect up to 2 devices simultaneously. When you blast the UE Megaboom up all the way, you’ll get 90dB. Put that on a scale and 90dB is close to 100dB, which is comparable to a bar at a nightclub. Although we must admit, decibels are logarithmic, not linear. This means it doesn’t go up the same way as age or numbers do. In addition to the decibels are the 2-inch drivers. For those who don’t know what drivers are, their responsibility in the speaker is to convert electrical audio into sound waves. With Megaboom having 2, it’s no wonder why it has so much volume and maintains pristine quality. Combine its decibel power with its durability and you got a perfect template for one of the loudest Bluetooth speakers in 2018. Do you really need any more marketing if your speaker is named “Sharkk Beast”? Coming in at 45 watts of pure power, it holds up against the competition. Its dimensions are smaller than the Cambridge 200 at 10.2 x 6.3 x 2.8. But its leverage against other speakers is its technology. Similar to the Balanced Mode Radiator, Sharkk Beast has its own patented technology. The name of it is Maxxbass Technology. Its impact is subtle but effective. To illustrate, let’s paint you a picture. You’re sitting at your desk doing work and get a notification on your laptop your favorite artist released a new song. What you do next is find out what platform has the song and start playing it. But any true music person knows there is a substantial difference listening to music on your laptop versus your car. What you hear in your car or at a concert are a deeper bass and subtle sounds. With Maxxbass Technology, you’re able to hear the deeper bass on smaller devices such as your laptop. This is the reason smartphones and other smaller devices have more thump in them. Its distinct technology gives it an upper hand against other competitors. As for disadvantages, there’s no mention of durability in manufacturer notes or customer reviews. Since that’s the case, we’ll assume it doesn’t have the best qualities to withstand bad conditions. Oh, baby are you in for a treat. When you think state-of-the-art…you think the top of the class. It doesn’t matter what product, industry, or competitors are present. Top of the class is singular. This is what we think of Naim Mu-So. With 450 watts of power and 6 custom-designed speakers, you’re getting a workhorse for a speaker. Buying one also gets you one midrange, one woofer, and one tweeter. Combine this with tremendous bass, a frequency range of 48 KHz, and you’re getting the full package. Purchasing one enables you to connect to most devices. So streaming in the living room or your laptop isn’t a problem. Once you get a glimpse of the design, you’ll be even more impressed. It seems there is nothing wrong with this speaker as everything comes with a premium. This is why its retail price is at a premium. The last one was cute. This next one is just NASTY. If you saw it for the first time you would think a concert speaker is sitting in someone’s living room. Truth is, it might just be a concert speaker. When you have a powerful integrated amplifier with DUAL 8-inch subwoofers, you’re really not playing games anymore. If you’re looking for a home speaker system, you just found it. 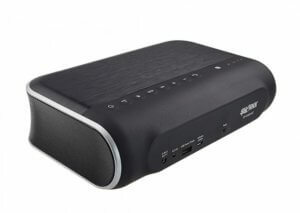 It also has a high-frequency range perfect for streaming music and movies. The deep bass and high output make it durable for indoors. It’s large. It’s loud. And it’s impactful. It goes from box opening to the speaker playing music. Although it’s a long video, it’ll provide everything you’ll need to know regarding the speaker. This speaker is a change of pace. You can tell it’s different than the rest instantly because of its design. In fact, not only does it look old, but it can connect with CDs and turntables. But that doesn’t change the fact it’s one of the loudest Bluetooth speakers in 2018. Its 90-watt output is ridiculous. Combine that with 110 decibels and it easily ranks at the top in terms of pure volume. The combination of amplifiers, woofers, and tweeters give it a wide range of frequencies. Its frequency ranges from 35hz – 22kHz. With that large volume comes its dimensions. 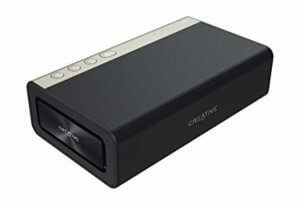 Although it isn’t huge, its formed like a speaker box which makes sense considering all the power. At 15.75 x 11.5 x 7.87 inches, it has the dimensions of a rectangle. It literally looks like one of those speakers rock bands used to play right next to. That’s why it has a 3.5mm input part of the package. The cable provides an input for guitarists. Its combination of power, design, and simplicity make it great for concerts. 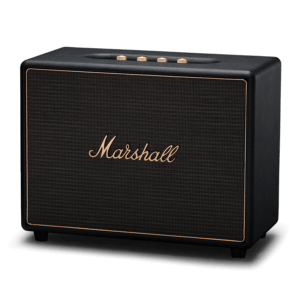 It’s no wonder Marshall has been the leading brand for guitarists and rock bands for decades. When it comes to design, there’s nothing special going on with the RIVA Turbo X. But as far as the loudest Bluetooth speakers in 2018, it’s definitely in contention. When using this speaker, you’ll be provided with multi-dimensional surround sound. And that’s no exaggerations because it provides 100 decibels of power. It’s another one of these speakers which have their own proprietary technology. An advantage of the RIVO’s technology is its signal power. Its ability to reproduce signal power without excessive compression is its competitive advantage. It doesn’t need extra subwoofers. In the industry of hi-fi speakers, sound quality will always reign supreme. For RIVO, its number one focus is sound quality. This is what spreads out onto other entertainment experiences. 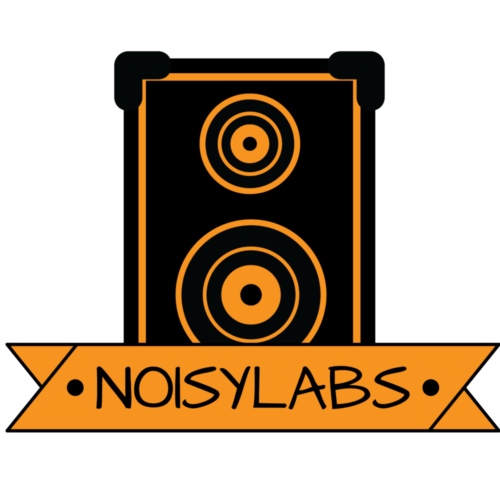 Sound quality matters when it comes to movies, video games, televison, and more. 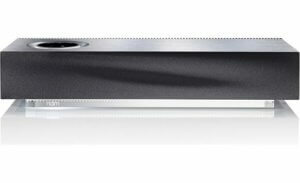 In addition, RIVO’s speaker has 2 buttons which amplify its impact. One button is labeled “T”, and the other one is labeled “S”. If you press the T button, you’ll boost the volume. When you press the S button, you’ll activate the surround sound option. You can only imagine how loud this can get. And if you’re still on the fence about investing into this, understand its versatility. Its water and weather resistance capability make it perfect for the great outdoors. Compared to the other speakers we’ve talked about, this speaker is great for both indoors and outdoors. You can’t say that about every speaker. We swear we’re not making these names up. But here’s a question for you. More than likely you wouldn’t correct? Don’t be fooled by brand names though. A lot of it is marketing. What’s more important is finding the perfect combination of design and sound quality for a speaker. And make no mistake about it, the “Devialet Gold Phantom” fits the bill of great design and sound quality. When talking about its design, it doesn’t even really look like a speaker. It looks like an unidentified flying object (U.F.O). Honestly, its design doesn’t compare to any other. Most of the pictures you see will display its creamy colors. A creamy white with a shiny gold makes it look even more appealing. Aside from its luxurious design, its performance is even more attractive. With a 4500 peak wattage, we can’t even comprehend how strong that is because there’s nothing to compare it to. One relatable number on its performance is the 108-decibel power. Other hi-fi speakers hover in that 100-110 range so it’s common. But another crazy number is its unparalleled frequency range of 14Hz-27kHz. The ability of the speaker to cover such a wide-range is expected. But the range is still far above and beyond the others, it’s comical at this point. One unique feature of this speaker is the 3 EQ modes it has. The 3 modes are classic, party, and surround. If you’re a movie person, surround sound is your preferred mode. 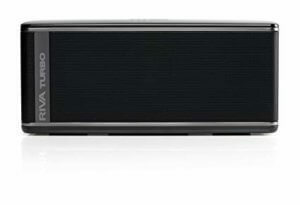 Its strong bass is built upon 2 5W drivers, 1 10W subwoofer, and 2 passive radiators. In addition to that is its aptX technology. With this technology, you can stream high-quality audio and not lose the quality of sound. 2 qualities which make it perfect for the outdoors is its battery attributes and its weight. The distinguishing feature of the battery is there’s a built-in power bank slot for phone chargers. As for the weight, it only weighs 1.76 pounds which makes it mobile. The dimensions are 3.9 x 2.1 x 9.4 inches which means you can fit it right on your palm. For a solid price, you can get a speaker that provides an all-around entertainment experience. Technically, this is a Bluetooth portable speaker, but it’s pretty heavy. Coming in at 18 pounds, its built more like a dumbbell than a speaker. Nonetheless, it’s still really loud. Since it’s so massive, it comes with 4HD audio drivers and 1 subwoofer. This is what makes it so loud. Add the fact it’s so durable because it’s water-resistant, sandproof, dirtproof, and you get a speaker that’s great for camping. This is how the Sound Blaster is marketed. And we believe it because first of all, it has 5 drivers, and it’s a small speaker. Included in the speaker are 2 high-frequency drivers, a woofer, and 2 passive radiators. 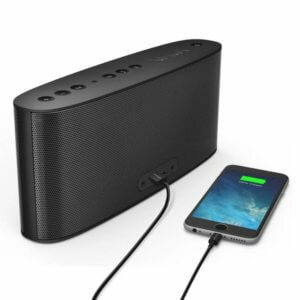 Most portable Bluetooth speakers come with a single amplifier. But the Sound Blaster comes with 2 amplifiers. 1 amplifier has the responsibility of driving the lows and mids while the other one delivers high frequencies. Combining both amplifiers makes the sound quality of this small speaker clear. And if you wanted to augment bass, you have the TeraBass feature. Weighing in at 3.6 pounds, you wouldn’t believe how loud it is, but it still has an extra gear it could go to which makes it more surprising. The extra gear is called the “overdrive function” which brings its sound to the next level. Think of the overdrive function as a turbo boost button. The design of this speaker is sleek and modern. Its shape allows it to be great for walking around and placement around the household. If you’re looking for a small gift, this would be a great start. Just like the UE Megaboom, this speaker also provides 360-degrees of sound. Its durable aluminum body provides water-resistance and is made with portability in mind. Although its design makes it look like a lantern, its brand (BOSE) prides itself on quality all the time, every time. What makes the sound great is its 2 passive radiators, efficient transducer, and an omnidirectional acoustic deflector. 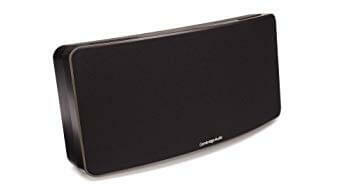 From the design to the sound quality, although expensive, makes it a great speaker to have around at a party. Compared to the other speakers, this is competitive from a price point. What makes this one of the loudest Bluetooth speakers in 2018 is the overall package it delivers. It has 2 15 watt full-range drivers and 2 passive radiators. If you play the volume all the way up, the super bass won’t interfere with more than 1% total harmonic distortion. It also has a wide frequency range. From deep lows to crisp highs, the response it has on each spectrum makes it an ideal outdoor speaker. Another addition which makes it louder is the ability to connect speakers with it. You can easily connect up to 2 speakers for the left and right channels. When you combine this speaker with 2 others, you’ll have a combined output of 60 watts which is more than enough to fill up your backyard. Just note that the speaker itself is designed to be played at maximum volume. And we can tell you that’s already very loud. So adding more speakers means you’re running the risk of blowing out some people’s eardrums. Another factor which makes it great for the outdoors is it’s actually water-proof. This means it can be submerged in up to 33 feet of water for 30 minutes and come out fine. It’s not like other speakers where it says they’re water-proof but can only get splashed on. Although it’s built like a fortress, it’s still great to have around because it’s visually appealing. It’s not the best for hiking, but if you plan to be outside while stationary, this speaker is perfect. Another speaker built like a tank. If you’re not noticing by now, most speakers that are built like a tank are the most durable. This one isn’t an exception. It has a rubber base and a protective rubber base. The rubber base is great so the speaker won’t slip in slippery areas. 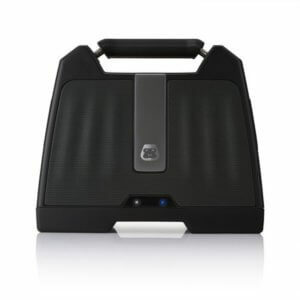 As a big speaker, it has the ability to cover a wide range of frequencies also. Reviewers who tested the product say it has a pleasant-sounding midrange along with a “punchy” bass to keep it competitive. Minute details in a song like a guitar strum or drum impact are apparent when played on this Bluetooth speaker. Whenever small details like this can be heard, it’s a sign of a great speaker with exceptional audio quality. We don’t have a ranking system for this post because each person’s situation is different. We wanted to give an objective review for each speaker with facts and logic so the consumer reading this can make their own decision. Especially when you consider the prices of all these speakers. There’s no way everybody is going to purchase only one type of loudspeaker. Hopefully, through our review you’ll have a better sense of the marketplace when it comes to the loudest Bluetooth speakers in 2018.